The SNP's Christina McKelvie branded the system 'class warfare' after hearing evidence from jobseekers. The modern-day "buroo" is a depressing place where fearful jobseekers are bullied and reduced to tears by unhappy public servants who stink of Red Bull, MSPs have heard. People on the UK Government's welfare-to-work scheme are forced to sit in open-plan phone banks for eight hours a day repeatedly cold-calling frustrated companies who do not have any work to offer, jobseekers told Holyrood's Welfare Reform Committee. Letters from the Work Programme to one large council employer are immediately sent to the shredder, it was claimed. Claimants gave evidence to the committee on a first-name basis only for fear of incurring sanctions by the Department of Work and Pensions (DWP). Donna, a former Church of Scotland development worker from Glasgow, said the Jobcentre only compounded the stress and illness she experienced when she was made redundant after a lifetime in work. She said she "felt very bullied" by the first adviser she was allocated. "He made me feel like I was imagining my problems and I didn't have any problems," she said. "He was saying to me: 'It's not like you've got a leg missing.' Each time he made me greet. "I would have been in a mental institution if I had stayed with that first adviser - or I would have shot him." She added: "The atmosphere of these places, you go in and it smells of Red Bull and there's a horrible, fearful atmosphere. "It's the staff that are sitting with Red Bull a lot of the time and the people that are coming in. Nobody is happy. It's not a happy space." She continued: "If people go to the buroo, I'm using old-fashioned language, and were made to feel like, 'how are you today? ', instead of making you feel like, 'you're beneath me', I'm sure that it would enable you to work, you would believe in yourself and you would go out and do your job. "But people keep putting you down, and therefore you then believe it." The "buroo" (or "broo") is a Scots colloquial term for the former Employment Bureau, now the DWP. Jacqueline, known as Jake, from Glasgow, said: "Sometimes you sit on the phone from nine to five each day making calls for jobs but you know you're not going to get anything. It's depressing." 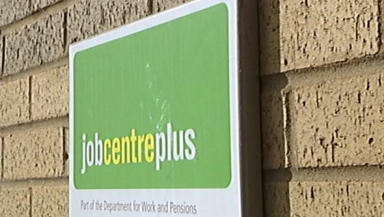 SNP MSP Christina McKelvie said the system amounts to "class warfare" with "propaganda" against the unemployed. "A report from the DWP suggested only 24% of people going through the work programme were successful and only 9% of them were in a job after a year," she said. "The DWP had paid the providers £1.8bn since the scheme had started for that kind of outcome. Is all of that money worth it?" Labour MSP Neil Findlay said: "If it is as described, this is in effect state-sanctioned cold-calling. This has really disturbed and upset me. In fact it has disgusted me. "The system that we have created and the atmosphere in this system is so wrong, I find it incredible the more evidence that people presents to us. "It also disgusts me what they have done to public services on the frontline having to deal with people going through this bloody system, because I don't think for one second 99.9% of them want to treat people like this."